On Friday March 10th at 18:00 we’ll welcome La Murga 'Los Bambones' at Siam Mall to fill the mall with good music and positive energy. It will be great!. 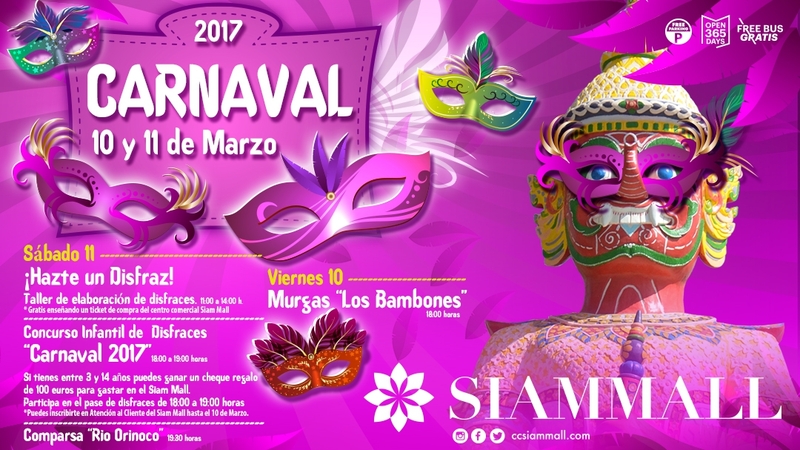 On Saturday March 11th from early on, in Siam Mall we’ll have activities for everyone to enjoy an unforgettable Carnival. From 11:00h to 14:00h, our visitors will be able to participate in a workshop about elaboration of costumes by showing their shopping ticket. So cool! At 18:00h we’ll have a Carnival Children's Costume Competition, where children between the ages of 3 and 14 will be able to compete for a gift card of 100 euros *. That same day at19:30h we’ll have the Comparsa 'Río Orinoco' touring our shopping mall . Come and have fun at Siam Mall!